By the mid 1930s, Maillart's reinforced concrete bridges and building structures had brought him wide recognition. His ability to understand and solve complex structural problems with functional, cost-effective visually interesting solutions was unparalleled in Switzerland at the time. However, in 1936 the continuing worldwide economic downturn forced him to cut staff working hours and reduce salaries by 10%. 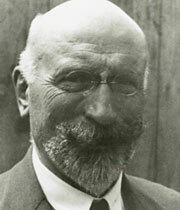 Ingenieurbureau Maillart's business dwindled to almost half its 1932 level. The firm tendered for contracts but was unsuccessful, perhaps partly because Maillart's rivals Professor Max Ritter (1884-1946) in Zürich and Adolf Bühler (1882-1951) of the Swiss National Railway were often appointed to vet the submissions. The firm did enter 14 bridge competitions, though, and more than half the entries were successful. The European political climate was also deteriorating. Italy had invaded Abyssinia (now Ethiopia), Germany moved troops into the demilitarised Rhineland (western Germany) and the Spanish Civil War began. First the Winter, then the Summer Olympic Games of 1936 were held in Germany. On 23rd January 1936, Maillart's elder brother Paul, a fur dealer at Maison Roeder in Rue du Rhone, Geneva, died at the age of 69. Maillart was not all that well himself, with continuing leg pain and recurrent insomnia. Then, in the early hours of 4th July, as he was preparing for bed he slipped and fell, breaking his left femur. His leg was placed in traction and he was in hospital in Zürich until 14th October. By mid November he was up and about but using a walking stick. He continued working while in hospital. Projects completed in 1936 include Quai Turrettini in Geneva and the Twannbach Bridge (Twannbachbrücke), a three-hinge hollow box arch in Berne canton. The 1936 deck-stiffened arch design for the Aire Bridge at Lancy (Geneva canton) wasn't built at the time but would be redesigned in 1947 and 1952 by his successors at the Geneva office, and open in 1954. One major though unprofitable project was the Arve Bridge (Pont de Vessy) over the Arve River, south east of Geneva. Maillart had submitted a scheme for a three-hinge arch in December 1934 — a daring variation on the Salginatobel Bridge, with the end hinges in the span rather than at the abutments, and X-shaped cross walls. In July 1935, he had been commissioned to prepare the drawings. However, the firm's tender for construction proved to be the most expensive. 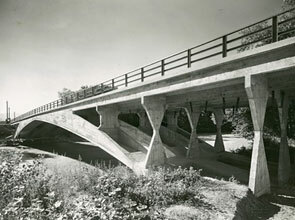 In the end, Maillart supervised the contractor and the bridge was completed in 1937. In February 1937, friend and Zürich city architect, Hermann Herter (1877-1945), asked him to work on a large swimming pool hall to be completed for the opening of Landessausstellung (Swiss National Exposition) in May 1939. Given the growing threat of war, an air-raid shelter was included. It was a timely commission for Maillart, who had been contemplating giving up the Zürich office/apartment as the workload declined — 1937 was his worst business year since 1922. On doctor's orders, Maillart lodged at Hotel Waldhaus, the spa at Vulpera in the east of Graubünden canton, from late July to mid August. Annual hot spring 'cures' were very popular throughout Europe, and Maillart would take two more. The bold Marchgraben Bridge (Marchgrabenbrücke) of 1937, a four-span continuous beam road bridge with a hairpin bend, located near the Saanenmöser Pass in Berne canton, was another project that ending up being deferred. It would be redesigned in 1946 by the Berne office, and open in 1947. Schemes that were completed in 1937 include a continuous beam bridge at Gündlischwand (Berne canton) and the rebuilding of l’Eglise Saint-Joseph in Geneva. Meanwhile, Maillart's elder son Edmond (1902-62) had moved from England to Pennsylvania, USA, around 1935, to work as a welding engineer. By mid 1938, he was unemployed and in financial trouble. He appealed to his father and on 2nd July Maillart sent him a sum of money from the health insurance payout he had received after breaking his leg. However, he warned Edmond not to expect more. Two days later, his daughter Marie Claire Blumer-Maillart (1906-2009) and granddaughter Marie-Claire Blumer (b.1930) came visiting from Sumatra (Indonesia). On 10th July 1938, the three of them travelled to the Hotel Waldhaus for three weeks at the spa. 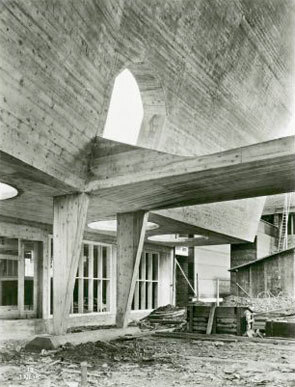 During 1938, apart from completing a skew bridge over the railway in Berne, Maillart was primarily working on two further buildings for the Landessausstellung. He designed the concrete superstructure of the Congress Hall (Kongresshaus), while Robert Naef (1899-1958) worked on the iron and steel elements and Pierre Soutter (1899-1977) the foyer and foundations. 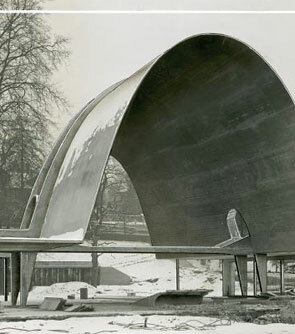 However, the most innovative building was the Cement Hall (Zementhalle), a curved shell of reinforced concrete only 60mm thick, designed with architect Hans Leuzinger. The structure was completed by 1st December 1938, opened to the public on 6th May 1939 and tested to destruction in February 1940 for scientific research. 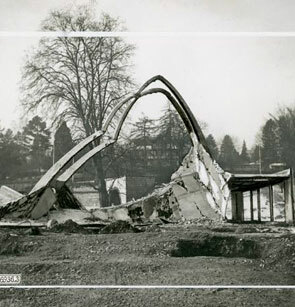 Maillart wasn't the first to experiment with thin shell structures, though the open-ended Cement Hall was a new form. In 1922, Walther Bauersfeld (1879-1959) and Franz Dischinger (1887-1953) had designed and patented a reinforced concrete roof 50mm thick and 40m in diameter for the Zeiss factory planetarium in Jena, Germany. It was the type of structure later known as a geodesic dome. Following Maillart's lead, engineers such as Pier Luigi Nervi (1891-1979) in Italy and Oscar Niemeyer (1907-2012) in Brazil started working with thin concrete shells. In September 1938, Maillart's son-in-law Eduard Blumer (1901-80) joined the family group, with his sister and niece. In October, they all visited the Cement Hall and the Zuoz, Landquart (Klosters) and Salginatobel bridges. Winter found Maillart working on the design of new premises for Swiss trading and production company A. Baur & Co. for a site in Colombo, Ceylon (now Sri Lanka). The five-storey office and apartment building would be completed in 1941. Maillart toyed with the idea of visiting to oversee construction, and travelling on to Sumatra to see his daughter but it was not to be. Maillart celebrated his 67th birthday on 6th February 1939. Marie Claire, her husband and their family members returned to Sumatra 10 days later. Worryingly, Switzerland's neighbours were gaining in power and increasing their territories. Europe was edging closer to war once more. On 15th March 1939, Adolf Hitler (1889-1945) swept into Prague in the wake of the German occupation of Czechoslovakia, contravening the Munich Pact. On 7th April, Italy invaded Albania. Maillart was working on the Simme road bridge (Simmebrücke, Garstatt, Berne canton). He had begun designing its three-hinge span in 1935. It took the concept of a 'broken' arch to its limits: while the arch of the Pont de Vessy is pointed, at Garstatt the underside of each half-span rises in a straight line from the abutment hinge to the central hinge. By the end of June 1939, Maillart's health was deteriorating. He spent a couple of weeks at Gurnigelbad spa in Riggisberg, Berne canton. While there (and later) he worked on two bridges over the railway between Altendorf and Lachen, Schwyz canton. The contractor was to be Florian Prader (1883-1946). The three-span continuous beam bridge (1939) and two-span three-hinge arch Churerstrasse Bridge (Churerstrassebrücke, 1940) were two of the ten major projects they worked on together. The Churerstrasse project was to be Maillart's last bridge. On 1st September, the German army invaded Poland, and two days later Britain and France declared war on Germany. Most business ceased in neutral Switzerland as the country mobilised against possible invasion. All Maillart's remaining staff were called up, except Ernst Stettler, who worked on. While alone at home on 11th October, Maillart suffered a haemorrhage connected with his kidney problems. He took a taxi to hospital where he underwent an operation on 24th October. Two days later he had a severe heart attack, followed by another before mid November. He left hospital on 5th December in the care of his sister Rosa Wicky (1865-1950). On 20th he returned to work, travelling from Geneva on his usual round of visits to projects in Berne and Zürich — and on New Year's Day he was well enough to attend a party with ten family members at Brasserie La Bâloise in Geneva. Maillart's enthusiasm for work was undiminished even as his physical frailty increased. His last article "L'ingénieur et les autorités" (The engineer and the authorities) was published in the January-February 1940 edition of Vie, art et cité. In it, he addressed what he saw as the constraints on engineers: a structure's own restrictions and the limitations of society. On 26th January 1940, his friend and associate Professor Mirko Ros (1879-1962) started load testing the Cement Hall concrete shell. Both men were on site for the tests. The planned programme was supposed to be completed by the end of the month, culminating in the structure's collapse, but the shell was much stronger than anticipated. When it eventually came down, on about 4th February, it was soon stripped of the reinforcing bars, as steel had become an expensive commodity. Maillart celebrated his 68th birthday in Geneva with a meal cooked by Rosa, followed by a game of bridge. But by March, he was confined to bed and had lost a lot of weight. He was now below 68kg compared with the 79kg he had weighed at the spa in July 1938. On 12th March, Maillart returned to hospital where he was diagnosed with an intestinal ulcer, which was later found to be a tumour. He died at 4am on 5th April 1940, with his younger son René (1909-76) at his side — Edmond was in America and Marie Claire in Sumatra. His funeral was held on 8th April and he was buried in Geneva's Cimetière du Petit-Saconnex. His oldest friend, electrical engineer Paul Nissen, who had known him before he went to Russia and remained a lifelong ally and who had visited Maillart only a few days before his death, spoke at the graveside. Arve Bridge (Pont de Vessy) photographed in 1935. Note the slightly pointed arch. 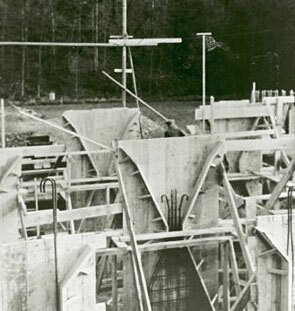 Formwork for the casting of the piers, Arve Bridge. The extraordinary Cement Hall (Zementhalle), designed with architect Hans Leuzinger for Landessausstellung (Swiss National Exposition) of May 1939, Zürich. 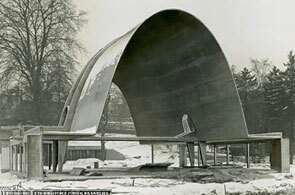 The Cement Hall consisted of a curved reinforced concrete shell just 60mm thick. The idea was to demonstrate what could be achieved with concrete. Detail of the Cement Hall. The Cement Hall, load tested to destruction in 1940 for research purposes.